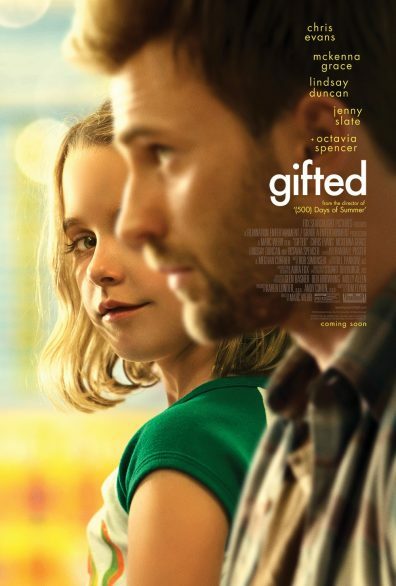 Movie Review: GIFTED "Kramer Vs. Kramer" meets "Terms of Endearment" - sandwichjohnfilms Movie Review: GIFTED "Kramer Vs. Kramer" meets "Terms of Endearment"
Movie Review: GIFTED "Kramer Vs. Kramer" meets "Terms of Endearment"
"Kramer Vs. Kramer" meets "Terms of Endearment"
GIFTED is an emotional endearing film, which is interesting because I do see it like the perfect cross between “Kramer Vs. Kramer” and “Terms of Endearment.” It’s a film that is as adorable as it is heartfelt with great performances by all the actors involved including the ultimate scene-stealer, Fred the one-eyed cat. Chris Evans plays a single man, Frank, raising his super smart little niece, a child prodigy, Mary, (McKenna Grace) in Florida. They live a normal regular life but Mary clearly considers her current education level as something that’s beneath her skills. The seven year-old’s incredible mathematical ability reaches the attention of Frank’s mother, Evelyn (Lyndsay Duncan) who plans to take her granddaughter away from Frank so that she could send her to boarding school for intelligent students. This starts a custody battle that will ultimately determine which side really knows what’s best for Mary. Co-starring Octavia Spencer as Frank’s landlady and best friend, Roberta, and Jenny Slate as Mary’s teacher, Bonnie, who develops a relationship with Frank. But what’s even more interesting is that even though at times the characters can appear adversarial, outside the court, they’re quite cordial. I like that because as complicated as family can be, you can remain civil about it. The confrontations make sense which is a brilliant move on the film’s part because the audiences will find themselves conflicted. On one hand you want Mary to be with kids that would challenge her intelligence, you want her potentials to be sharpened. On the other hand you also want her to be a regular happy kid. So there’s not really a bad guy in this scenario. After tackling “The Amazing Spider-Man” and “The Amazing Spider-Man 2,” director Marc Webb comes back to a world that reminds us that he once made “500 Days of Summer.” The drama in “Gifted” is warm and inviting, not overbearing. That’s the tone he sets from start to finish. It goes to show how precious it is to be genuinely caring for someone other than ourselves. Saw an advanced screening. The movie will make you laugh and it will make you cry but in the end will make you happy.